With Sheldon’s Visual Aider, it is rare for a student’s view of a demonstration to be blocked. 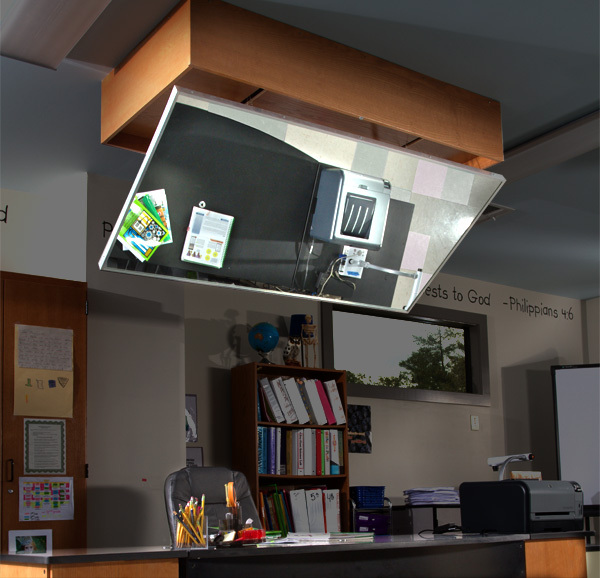 The retractable demonstration mirror gives every student an unobstructed view of tabletop demonstrations, and the easy switch control makes the use accessible to teachers. 66″L. X 34″ W. X 14-3/4″ H. Overall. Consisting of one framed mirror supported on cables and safety chains that may be hung exposed under the ceiling or flush within the ceiling. Wall mounted control switch activates mechanism that raises or lowers the mirror into viewing and storage positions. Center provided with limit switch mechanism.